Environmentalist John Lopez favors keeping the pass open as a natural land-building strategy. Mardi Gras Pass, which seemed destined for closure a week ago, may have caught a chance at new life. Coastal groups opposing an oil company’s permit application to close the crevasse on the east bank of the Mississippi River, about five miles south of Pointe à la Hache, say discussion among all interested parties may clear the way to a compromise. “We’re hoping to have a meeting with all the parties this week, and with engineers, because we think there are ways to meet the concerns of everyone concerned,” said John Lopez of the Lake Pontchartrain Basin Foundation, which had been leading the push to save the newly created opening. The crevasse opened during the spring flood of 2011, allowing sediment-rich river water to flow into wetlands at the site of the Bohemia Spillway, built in 1926 to help relieve flooding threats to New Orleans, but out of active use for decades. Coastal advocates called it a “cost-free” sediment diversion, a key strategy of the state’s $50-billion Master Plan to reverse coastal land losses that threaten the future of southeast Louisiana. They named it “Mardi Gras Pass” because it opened during the Carnival season. But when the river blew through its banks, it also cut through a road that Sundown Energy used to access its nearby oil and gas field. The Dallas-based energy company filed a permit to close the crevasse, but also agreed to consider adding culverts so water could continue to flow under a rebuilt road. As an alternative, it even offered to help pay for a bridge to span the gap. Environmental groups rallied around the cause, and drew support from the Southeast Louisiana Flood Protection Authority – East. But the state’s Coastal Protection and Restoration Authority weighed in on the side of closing the crevasse, citing concerns that if left unmanaged the opening could widen uncontrollably, becoming a costly mistake that would require expensive repairs before other planned diversions could be created. That coastal authority’s position seemed to make moot last week’s public hearing on the permit application. 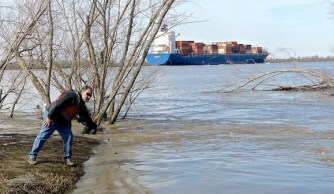 In fact, only the Louisiana Wildlife Federation and the flood protection authority opposed the permit. Lopez said that was because other coastal groups think there may be engineering solutions that would allow the pass to retain its current size and flow rates, but prevent it from growing any larger. If that could be managed, it would make rebuilding the road easier, and give the state time to study possibly using Bohemia as the site for its planned diversion in the area. Robin McGuire of Sundown said in an email that the company “remains open to alternatives. However, we have yet to hear of anything concrete that changes our position on the current permit application” to close the crevasse and install culverts so the company can rebuild its road. Garret Graves, chairman of the coastal authority, said Lopez and others had brought up “very good points” for how to maximize the use of the new pass and the Bohemia area. “If we can benefit the coast for ‘free,’ we would like to do that,” Graves stated in an email response. “The challenge is making sure that we are making decisions with our eyes open. “We’ve seen what narrow-minded, short-sighted river management decisions can do. If the engineers and scientists say that Bohemia is the best place to get sediment out of the river, I’d go out there with a shovel today. No one can say that with any certainty yet. The original version of this story misstated the name of the Southeast Louisiana Floor Protection – East.